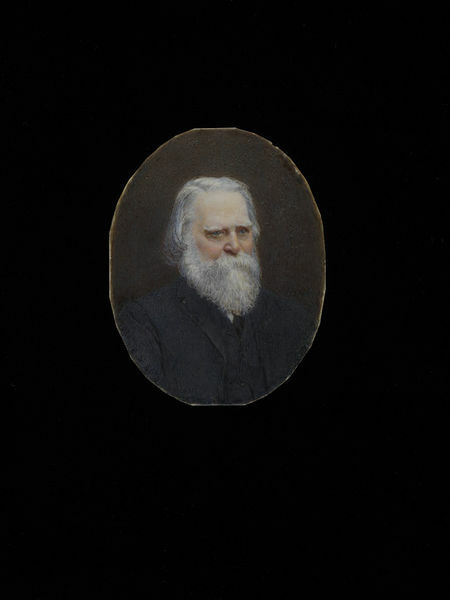 Miniature portrait by Rosalie Emslie, of an unknown elderly man, head and shoulders, against a dark brown background. The sitter has grey hair and full beard and moustache, and is wearing a black jacket and waistcoat. On the Departmental File for these miniatures is a copy of The Crown magazine for May 25th, 1907, which on page 355 in a section called 'The Art Galleries', noted that at 'The New Gallery' there was on display a 'case of miniatures by Mrs Emslie, photos of which appear on this page [6 were illustrated]. Mrs. Rosalie M. Emslie, better known as Mrs. A. E. Emslie, wife of Mr. Alfred E. Emslie, A.R.W.S., studied at the RA, and is represented there this year by miniatures of Miss Ines Pini, Miss Ada Clarke, Rosalie Emslie [presumably her daughter], and Madame Melba. Her style is very delicate and refined, and the melting tones recall the beautiful work of Cosway. She takes her rightful place among our leading miniaturists...'. This group of ten miniatures includes a self-portrait, two miniatures of the artist's husband, Alfred Emslie, as well as works painted on ivorine, a manufactured alternative to ivory, and a photograph of the same sitter in the same pose as in one of the miniatures (E.485-2010). 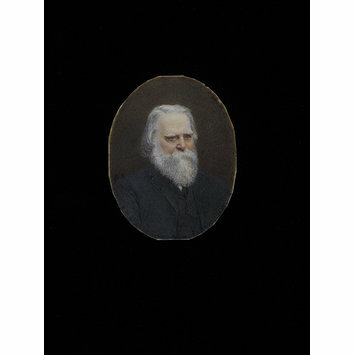 Additionally, the Museum acquired the certificate for Rosalie Emslie from the Royal Society of Miniature Painters (E.484-2010), a society that was established in 1896 and ushered in something of a renaissance in miniature painting up until the end of the 1920s. Miniature portrait of an unknown elderly man, head and shoulders, against a dark brown background, painted by Rosalie Emslie, England.